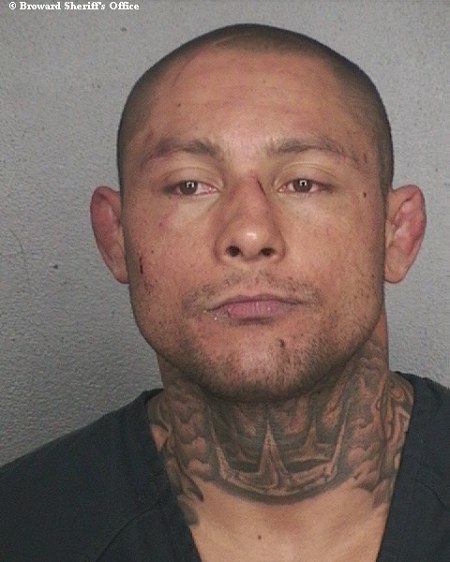 While sitting handcuffed in the back of a police car, UFC light heavyweight Thiago Silva (pictured) revealed Thursday’s arrest in Florida stems from a financial dispute with his wife, Thaysa Kamiji Silva. The Brazilian was reportedly armed with a weapon when he confronted people at the Pablo Popovitch Mixed Martial Arts Academy at around 7PM last night. Silva then fled to his nearby home and barricaded himself inside while police and SWAT set up a perimeter around his house. After a standoff with officers that lasted a few hours, Silva eventually surrendered without incident at about 11PM. It is unknown at this time whether Thaysa Silva, who is a black belt in Brazilian jiu jitsu, was at Popovitch’s facility or at the home she shares with Thiago when Silva was present with his weapon. According to the Broward County Sheriff’s arrest records, Silva faces multiple charges, including two counts of attempted felony murder, one count of aggravated battery with a deadly weapon and one count of resisting officer without violence to his or her person. Silva owns a 16-3 (2 NC) professional record. The 31-year-old’s two no contests are the result of failed drug tests – in 2011 he submitted a sample inconsistent with human urine and in 2012 for marijuana. Silva is currently slated to fight Ovince St. Preux at UFC 171 on March 15. The UFC briefly touched on Silva’s predicament when news broke late Thursday.